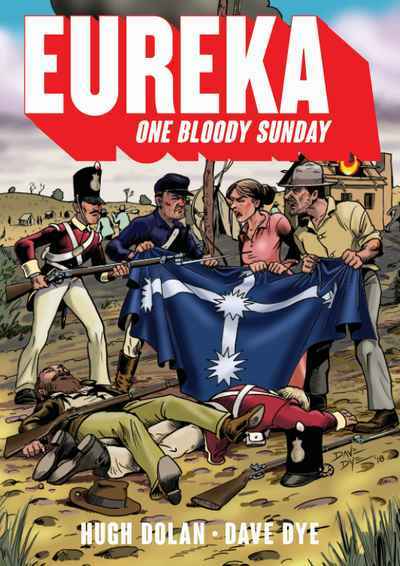 This graphic book brings to life the struggles of daily life on the goldfields and the powerful events of the Eureka stockade. The extraordinary story of Eureka is one that Australians have revisited since it happened in 1854. Why did British Army Red Coats fire on a group of miners hidden behind a crude wooden stockade? Why did soldiers from two famous British regiments attack a group of gold miners early one Sunday morning? What made the miners and their families protest and put their lives in danger? The reader is challenged to investigate — like a detective, you must sift through different accounts and reach your own understanding. People on both sides of the conflict believed that their actions were correct and justifiable. Readers will see actual letters from the governor, complaints from angry miners, as well as diaries and newspaper articles. This is not a book you can read while watching television. It’s so gripping you won’t want to.